Happy New Year! I hope your 2012 has gotten off to a fantastic start. And I hope 2011 was as momentous a year for you as it was for me. May 2012 be an even more outrageously great year for everyone! We celebrated the eve with a wonderful potluck with a few good friends. Every contribution was superfragilisticexpialidocious, I exaggerate not. I volunteered dessert, keen as I was to have a gander at a Mont Blanc recipe I'd flagged as mustmake from William Curley's Couture Chocolate. If it is any indication, it is but one flag amidst the thickets of other similarly intentioned stickies fluttering along the entire edge, planted in the heady throes of that first cracking open of an eagerly anticipated new cookbook. Jeni's Splendid Ice Cream Creams at Home by Jeni Britton Bauer The stupefyingly creative flavours had me at hello. As for the method? I was sceptical at first. How could a maverick eggless technique based, not on custard, but on cornstarch and cream cheese - virtually all the recipes in the book are based on this technique - be any good? Curiosity got the better of me. I tried one recipe, then two, then a whole bunch, and was consistently surprised, and occasionally blown away. The texture is certainly different from that of ice creams churned from mixtures with a custard base. Denser and more mouth-coating, which you may or may not like better than the classical. Odd Bits: How to Cook the Rest of the Animal by Jennifer McLagan The final installment to the author's trilogy - first, she gave us Bones to gnaw, then Fat to chew - will be devoured with equal gusto by all nose-to-tail lovers. With this ode to carnivorous mindfulness as our guiding light, whole beast, never again shalt thou be sacrificed wastefully, never thy cheek (or brain, ear, heart for that matter) be disgracefully turned away in disdain or disregard, we shalt not kill unless we promise to transform thee, all of thee that is, into a veritable beast of a feast. Momofuku Milk Bar by Christina Tosi This sweet companion volume to the original (which I'm equally crazy about) is the tell-all you've been waiting for if you have been trying to divine the mysteries behind such outré cult creations such as Crack Pie, Cereal Milk and Compost Cookies. Ruhlman's Twenty by Michael Ruhlman Once you acclimatize to the structure of the book (which makes finding recipes where you expect them to be a tad disorientating), there's a wealth of tips, tricks and techniques to be gleaned by every cook from novice to seasoned. Even better, there's stuff here that will inspire you to rethink and redefine your approach to tenets you've hitherto taken for granted. The Mozza Cookbook by Nancy Silverton This super cookbook is chockfull of the recipes which have made Osteria Mozza and Pizzeria Mozza so admired. Ms Silverton is unstinting in her generous instruction, sharing her secrets in precisely written recipes which allow the reader to recreate many of Mozza's signature standouts at home. If you've ever sunk your teeth into that slice of heaven also known as the Mozza pizza crust, resplendent with its puffy rim of a crisp-without-airy-within cornice, the meticulously detailed section on pizza dough alone is worth the book. Bocca: Cookbook by Jacob Kenedy This is no ordinary Italian cookbook. Then again, Jacob Kenedy is not your average bloke, or chef. If you have already been bewitched by the style, wit, charm and not to mention utterly delicious recipes of The Geometry of Pasta, this follow-up act does not disappoint. Mission Street Food by Anthony Myint and Karen Leibowitz This very cool and highly endearing book chronicles the evolution of a genre-defying restaurant - from pop-up in taco truck to pop-up in Chinese take-out - with humour and candour. That the recipes are kickass sweetens the deal. The making of the Mission Burger in particular is a work of mad genius (which should come as no surprise inspired as it is by gastro-wizard Heston Blumenthal's technique), elevating the humble patty without the trite use of highfalutin gimmicks involving truffles, foie and their posh brethren. Couture Chocolate by William Curley Ever since a visit to this sweet spot in Belgravia a couple of years back, I've become a huge fan (and am especially partial to their take on Jaffa cake). William and Suzue Curley are responsible for some of the most exquisite patisserie and chocolate London has to boast, and share in this wonderful book the recipes which have made their outfit a mecca for dessert devotees. PS: I was quite thrilled with how the Mont Blanc recipe I tried turned out (pictured at the beginning of this post). 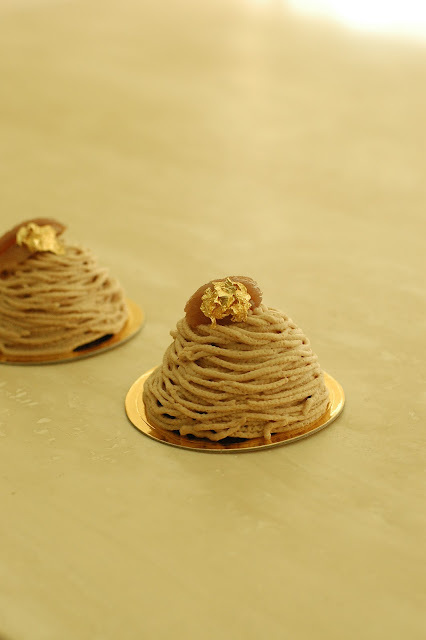 A chocolate macaroon base is filled with chestnut buttercream and chocolate diplomat cream before being cloaked in chestnut mousse, thus making for a Mont Blanc that's far less one-dimensional than the typical recipe. Heston Blumenthal at Home by Heston Blumenthal With a scope much wider than that of Family Food (not to mention more lavish use of photography), and recipes far more doable at home than those found in The Fat Duck Cookbook (and to a large extent, those from In Search of Perfection and Heston's Fantastical Feasts) whether thanks to lack thereof equipment or sheer dint of gargantuan effort, I suspect I will be reaching for this latest number much more frequently than the others. Mourad: New Moroccan by Mourad Lahlou Finally, a thoroughly modern book on Moroccan cooking with a gutsy and refreshingly innovative approach, adroitly sidestepping revisitation of that ubiquitous puddle of congealed chickpea puree that seems to lie left, right and centre of many a generic book on the subject. The production values are simply breathtaking, so much so I am exceedingly tempted to purchase an additional kitchen-only copy for actual use and abuse, loath as I am to besmirch its beautiful pages! The Food of Morocco by Paula Wolfert The revered Ms Wolfert serves up the most definitive and hauntingly evocative work - over four decades in the making - on the food of Morocco to date. It is the yin to Mourad's yang. If I had to do-over my cookbook collection and could only have one book on the traditional foodways of Morocco, this would be it. Nice reading this interesting post!! 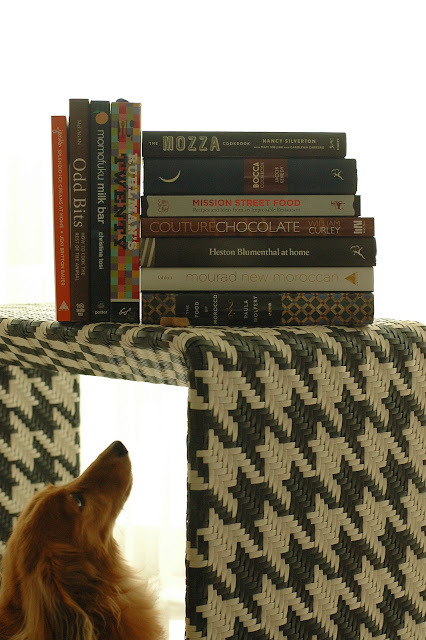 These are great cookbook suggestions. I especially like Jeni's Splendid Ice Creams at home. Not only does she have a wealth of recipes, but the photos are beautiful.